In Scania’s gigantic assembly hall near Zwolle, Defense yesterday took delivery of the first batch of new Scania trucks. 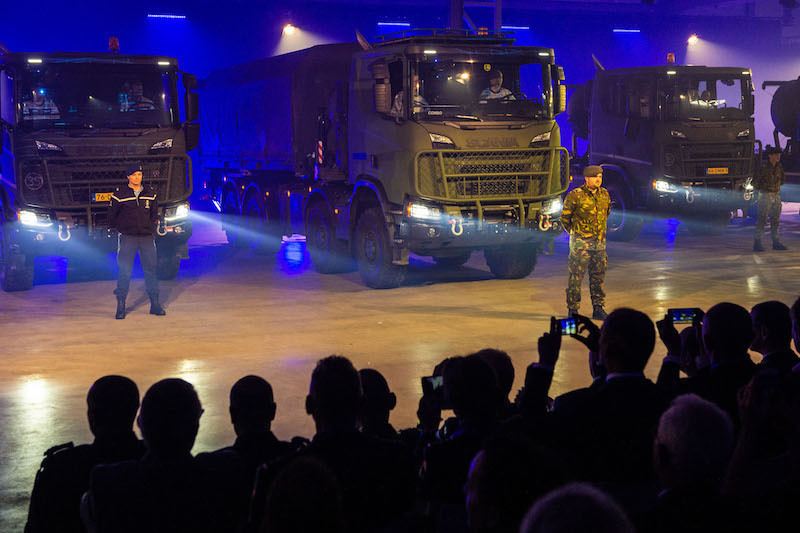 This new workhorse replaces the old 4- and 10-tonners that for decades formed the logistical backbone of the Dutch armed forces. In total, the armed forces have purchased more than 2,000 vehicles. The new trucks are a big step forward in many ways. The control of the Swedish product is a lot more modern. For example, cameras help the driver to prevent dangerous situations. Changing gears is also a thing of the past; the truck is automatic. This optimally adjusts engine power to every situation, which saves fuel. The normal cabin is relatively easy to replace with an armored version for operations and missions. The freight transport function has also improved considerably. The load capacity has been increased from 4,000 to 10,000 kilos. In addition, the vehicle can be fitted with a loading crane and / or aggregate between the cab and the loading floor. Flexibility characterizes all aspects of the vehicle. For example, the container frame on the chassis can easily be fitted with different modules. One moment there is a fuel module, a few minutes later it has been replaced by a personnel, freight or maintenance module. Minister Ank Bijleveld-Schouten, her Swedish colleague Peter Hultqvist, the director of the equipment organization Defense vice admiral Arie Jan de Waard and Commander of the Land Forces Lieutenant General Leo Beulen handed over the keys to the 1st users. The new vehicles fall under the project Defense-wide Replacement Operational Wheel Vehicles (DVOW). The DVOW consists of several subprojects for wheeled vehicles and additional systems, such as containers and lifting equipment.